Click on the image to download a free copy of this book. In this day and age, when a person desires to learn something new or become skilled in a particular field, he will seek some form of educational institution, be it a college or technical school, master’s program or certification. Years are spent, reports are written and book after book is studied, all to gain the desired knowledge. Look through the Gospels and you will see that this is the way Jesus taught His disciples. Through everyday events, Jesus revealed what the Father God was like. Whatever came His way became His teaching material—a child’s illness, a crowd of hungry people, the woman caught in adultery, the disciples’ dusty feet or a confrontation by the high priest’s troops. Jesus’ reason for taking 12 men to be His disciples was to teach them—through His example and the events of life—how to live like Him and do what He did. And the Bible shows how effective He was in that. Consider the time when the disciples asked Jesus to teach them: “One day Jesus was praying in a certain place. When he finished, one of his disciples said to him, ‘Lord, teach us to pray . . .’ ” (Luke 11:1, NIV). And Jesus taught them! But the teaching was not an end in itself. It was not knowledge for knowledge’s sake, but rather to spur them into action. And that’s just what happened—“Calling the Twelve to him, he sent them out two by two and gave them authority over evil spirits . . . . They went out and preached that people should repent. They drove out many demons and anointed many sick people with oil and healed them” (Mark 6:7, 12–13, NIV). Jesus desires the same for us today. We are given the accounts of Jesus’ life not just for the sake of knowing how He lived, but so that we, in seeing Him, might be changed— changed into the very image of Christ. Then we, like the disciples, can go and live for Him, suffer for Him and make a lasting difference on our world. This entry was posted in Journey with Jesus and tagged Bible, Discipleship, Dr. KP Yohannan, encouragement, gfa, Gospel for Asia, Jesus, Jesus Christ, kingdom of God, KP Yohannan on March 3, 2011 by gfaseo. Through the years I have been in ministry, I have found that the best way to encourage others in living a life of Christlike character is not in a classroom full of methods and rules, but rather as Jesus taught—through everyday life events. Through the pages of this booklet, it is my desire to walk together with you and point out the ways Jesus responded to the situations and the people He met while on this earth. 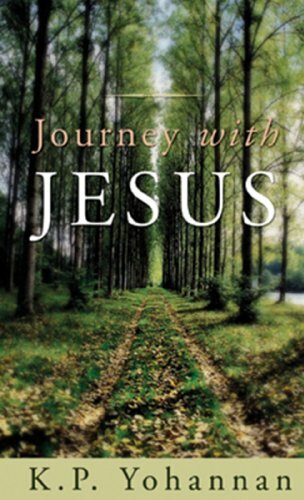 From His love and humility to His power and obedience, I pray that the message of this booklet would encourage you to continue your journey with Jesus, no matter what comes your way. For it is as we see Jesus in every moment of our lives that we not only learn from Him, but come to mirror Him as well, reflecting His character to everyone around us. In doing so, we bring glory to our God and Father. This is the desire of my heart, and I believe it is the desire of your heart as well. This entry was posted in Journey with Jesus and tagged Christianity, Discipleship, Dr. KP Yohannan, encouragement, gfa, Gospel for Asia, Jesus, Jesus Christ, journey, K.P. Yohannan, KP Yohannan on March 1, 2011 by gfaseo.